Scavullo’s name is synonymous with beauty and glamour. His images were born of a wild world of 1970s and 80s decadence. Scavullo was an extravagant personality, a close friend of Andy Warhol and a regular at Studio 54. A pioneer of American photography: Francesco Scavullo photographed stars from the world of fashion, film and music. His images appeared on the cover of Rolling Stone, Life, Time, Harper's Bazaar, Vogue, Mademoiselle, Glamour, Cosmopolitan, Harpers & Queen and L'Officiel, among many others. He was the exclusive cover photographer for Cosmopolitan magazine for 30 years. Scavullo had been interested in images of beauty from a young age and loved browsing his mother’s copies of Vogue and Harper’s Bazaar. He borrowed his father’s camera to take photographs of his sisters and their friends, who he styled to look like Hollywood stars. In 1945 he graduated from high school and worked for a fashion catalogue studio. After a short time he moved to Vogue and worked as an assistant to the legendary Horst P. Horst. After winning a contract with Seventeen magazine in 1948, he went on to open his own studio in Manhattan. He produced work for every major American fashion magazine and a great number of famous private clients. The photographer created images for film posters, album covers and Broadway shows. Famous album cover artworks include: the Diana album by Diana Ross and Once Upon A Time and Live More by Donna Summers. Scavullo’s work has aroused controversy. He created a storm with his image of a naked Burt Reynolds for a 1972 Cosmopolitan centrefold. 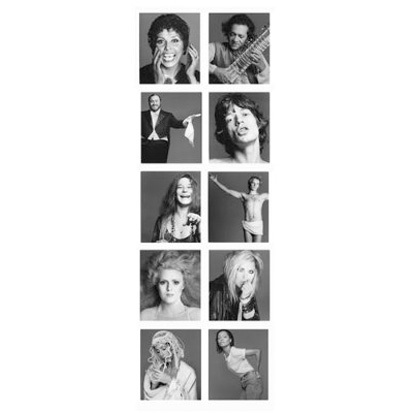 Renowned for his portraits, Scavullo was commissioned to photograph the icons of a generation, including: Grace Kelly, Elizabeth Taylor, Diana Ross, Cher, Brooke Shields, Kim Bassinger, Barbara Streisand, Michelle Pfieffer, Sylvester Stallone, among others. Scavullo’s work is the subject of six publications: Scavullo on Beauty, Scavullo Men, Scavullo Women, Scavullo, Scavullo: Photographs, 50 years and Scavullo Nudes. His work can be found in the permanent collections of the Museum of Modern Art, the Metropolitan Museum of Art, and the National Portrait Gallery at the Smithsonian Institute. Scavullo worked up until his death of heart failure at the age of 82.